Maintaining or strengthening economic growth to 2030 will require a significant increase in investment, including an estimated cumulative US$89 trillion of investment in infrastructure. A shift to low-carbon infrastructure will have an additional impact, changing both the timing and mix of infrastructure investment. A low-carbon transition across the entire economy could be achieved with only 5% more upfront investment from 2015-2030. From a broader financial perspective, the global economy could create value from the transition to low-carbon energy. Low-carbon infrastructure has significantly lower operating expenses and a longer expected lifespan than fossil fuel assets. Low-carbon infrastructure also has the potential to achieve lower costs of capital. We estimate that the full investment impact of a low-carbon transition in the electricity sector would be a net financial benefit of up to US$1.8 trillion over the period 2015-2035. This accounts for all investment impacts including stranded asset costs, and refers to a transition to a 2°C scenario from “business as usual”. A global low-carbon transition will lead to a decline in value of some fossil fuel assets, or “stranding”. Clear policy signals can reduce this value destruction by discouraging new investment in fossil fuels that would be at risk of stranding. The potential stranding of investment in the coal sector is less than for oil and gas, because coal produces less economic value per tonne of CO2 emitted, and there is comparatively less sunk investment in coal production, including coal-fired power plants. Over the next 20 years, reducing the use of coal can achieve 80% of the required energy-sector emissions reductions at only 12% of the total potential stranded asset cost, supporting a focus on coal in climate policy. There is sufficient capital available to finance a low-carbon transition. Accessing this capital will require the right long-term policies, however, including carbon pricing and regulation. Significant, near-term opportunities can reduce the costs of finance by up to 20% for low-carbon energy in all countries through a mix of financial innovation, greater use of national development banks and concessional debt, and increased development capital flows into low-income countries. Transitioning from a high-carbon to a low-carbon economy will require significant investment by all sectors of society. Industries, land owners and households will invest to improve efficiency. Energy producers will invest in low-carbon generation. Additionally, governments will invest in infrastructure to protect their nations against the long-term effects of climate change and to knit all of this new investment into a well-functioning, low-carbon economy. Governments will play a dual role. First, they will invest directly in infrastructure to ensure an ordered transition to a well-functioning, low-carbon economy. Second, they will influence the direction of private finance through regulation, incentives and other policy measures. This chapter touches on both forms of government action, but focuses on the role of governments in shaping and motivating private finance. Much of the needed investment in low-carbon infrastructure can be handled through existing structures and mechanisms, with the help of effective policy, regulation and market signals. Energy efficiency is an example where value is already created within the existing commercial environment for consumers and businesses, providing cash flows that can make these investments attractive. Other investment requirements will need more intervention. In these cases, creating new, efficient finance structures and directing finance into these new industries becomes more challenging and may require dedicated policy to initiate and continue the transition. Energy supply is an important example, as the energy sector accounts for around two-thirds of global greenhouse gas emissions. A low-carbon transition in energy supply requires the highest near-term financing, and some of the most significant changes in financial and industry structures. The good news is that between public and private sources, there is sufficient capital available globally to finance an energy transition. Many new industries and market structures are already emerging in both the developed and developing world. However, current industry and financial structures often allocate capital inefficiently, with risk, reward and geographic preferences that do not match well with an effective low-carbon energy transition. Some investors express concern that the transition will be unaffordable or will require capital that is not available. Others fear coal, oil and natural gas assets will suffer. The Commission has taken these concerns seriously and recognises that innovation in the financial sector will be as critical to the transition as innovation in the urban, land use and energy sectors. This chapter focuses on financing in the energy sector, given risk-return characteristics which are likely to see the most significant changes over the next decade. It begins by presenting estimates of the overall need for infrastructure investment between 2015 and 2030. Next, it discusses how to develop financing instruments and models which significantly cut the cost of investing in low-carbon energy assets, separately for high-income, middle-income, and low-income countries. Then it presents the likely additional investment and financial costs of an overall system shift to a low-carbon model that reduces the risk of dangerous climate change. Finally, it outlines how governments and private investors can minimise the risk of destroying the economic value, or “stranding”, of fossil assets during the transition. The chapter should not be viewed in isolation from the rest of the report. The focus here is the transition to a low-carbon energy system, with particular emphasis on investment in renewable energy. There are many other aspects of the low-carbon financing agenda which are touched upon throughout the report as a whole. Chapter 2: Cities describes some of the key instruments that will be needed to strengthen capital mobilisation at the city level, for investment in smarter infrastructure. Chapter 3: Land Use describes the forms of finance that will be needed to support tropical forest protection in the context of measures to increase overall capital mobilisation in developing country agriculture. Chapter 4: Energy addresses the challenge of mobilising capital for the more than one billion people who lack access to modern energy services. Chapter 5: Economics of Change considers the the institutional and policy frameworks for mobilising the necessary capital. Chapter 7: Innovation more specifically addresses the funding of research and development and the early-stage, low-carbon innovation pipeline. The global economy will require substantial investments in infrastructure as the population and the middle class grow. An estimated US$89 trillion of infrastructure investment will be required through 2030, based on data from the International Energy Agency (IEA), the Organisation for Economic Co-operation and Development (OECD), and analysis for the Commission (see Figure 1). This is chiefly investment in energy and cities. This estimate for the required investment is before accounting for actions to combat climate change. Savings of US$2 trillion to 2030 are estimated from reduced investment in fossil fuel power plants in a low-carbon scenario. A significant shift in the composition of these infrastructure investments will be needed to move to a pathway consistent with a good chance of keeping global average warming below 2°C. This includes increased investments in energy efficiency, and the deployment of low-carbon technologies. Improvement in efficiency of energy end-use sectors such as buildings, industry and transport could alone account for an additional US$8.8 trillion of incremental investment according to the analysis presented here (see Figure 1). Investment for the deployment of low-carbon technologies including renewables, nuclear and carbon capture and storage (CCS) could lead to an additional investment of US$4.7 trillion. At the same time, however, a low-carbon scenario could potentially also lead to savings in several components of infrastructure investment. Savings of US$2 trillion to 2030 are estimated from reduced investment in fossil fuel power plants in a low-carbon scenario. Reduced demand for fossil fuels could potentially also lead to further savings of US$3.7 trillion along the supply chain of fossil fuels. This includes reduced investment in the exploration and transport of fossil fuels. Another source of savings could be from reduced investment in electricity transmission and distribution, by an estimated US$0.3 trillion, as a result of greater energy efficiency and thus less demand for energy. The IEA projects that the savings from energy efficiency will outweigh the additional investment in the electricity grid needed to integrate intermittent renewable energy sources. Finally, the construction of more compact, connected cities, in an effort to reduce emissions, pollution and congestion and to rejuvenate the urban core, has the potential to reduce the overall infrastructure requirement for roads, telecommunications, water and waste treatment. Our estimates suggest that these savings could be worth cumulatively up to US$3.4 trillion by 2030. 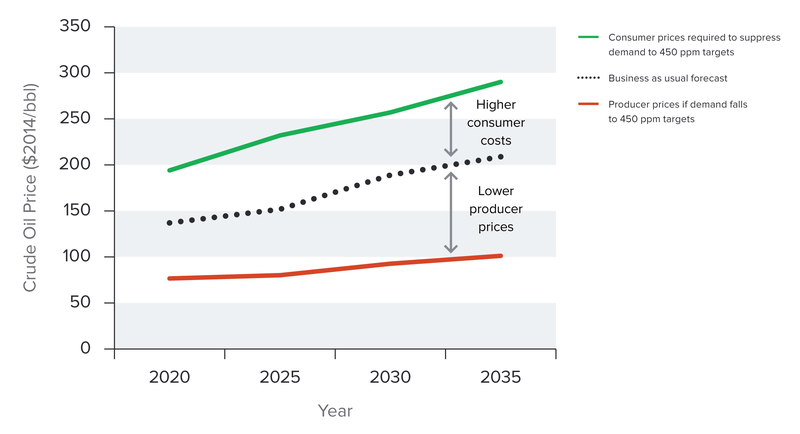 Figure 1 understates the scale of the transition that would occur in such an economic transformation, as investments shift from higher-to lower-carbon. Financial considerations other than upfront investment, such as lower operational expenditures from low-carbon energy, were not included in this comparison exercise. 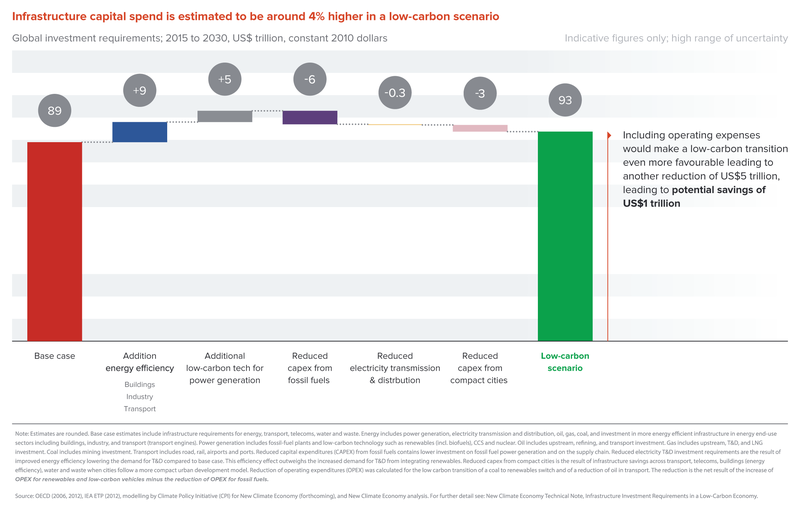 Including full, longer-term would make the low-carbon scenario even more favourable in terms of overall costs, leading to net savings of US$1 trillion. Section 4 of this chapter provides an in-depth consideration of wider financial impacts of a low-carbon transition in the energy sector. However, the transition to low carbon need not add substantially to the required energy investment. One way to illustrate the scale of the task to shift to a low-carbon energy economy is to measure investment as a proportion of fixed capital formation. The latter is a proxy for total investment across the economy. 5 IEA estimates of infrastructure investment suggest that a transition to a low-carbon economy would increase global energy investment from 9% to 12% of fixed capital formation. 6 Alternatively, this can be viewed as a shift in investment equivalent to less than 0.5% of gross domestic product (GDP), arguably a small shift given the scale of the risk and challenge at hand. Since the beginning of the 20th century, electricity financing has been characterised by the need to create scale and efficiency. Large-scale capital was provided by the public sector or through investors in regulated companies under a de facto government guarantee. As the industry grew, the quest for the lower costs that scale could deliver led to large, integrated, monopoly providers. These integrated utilities capitalised on lower costs achieved through scale across a network that connected generation, transmission, distribution and end users, relying on whatever was the cheapest energy source – fossil fuels or hydropower – available in their region. A revolution in electricity system design began in the 1970s, ’80s and ’90s, as governments and regulators saw the benefits of scale begin to taper off, and sought to increase innovation and flexibility and reduce the inefficiencies of what had become a large and monolithic sector. In 1978, the US Public Utility Regulatory Policy Act (PURPA) sought to promote energy efficiency and bring in non-utility generators and cogeneration in response to the oil crisis. Over the following years, many countries and regions developed independent power producers (IPPs), competitive short-term energy markets, privatisation, innovative regulatory systems and innovative risk sharing and financing schemes to enhance incentives for generators and utilities to improve efficiency and lower costs. New generators appeared, in some cases costs fell, and new investors entered the market and corporate structures shifted, sometimes beyond recognition. However, whether governments chose to introduce competition or remain mostly regulated, in most regions both the market and operating systems were, and are, still largely based around large-scale, mainly fossil fuel-powered, generation. Energy efficiency: Improving the efficiency of energy use and production is an important element of nearly every plan to achieve a low-carbon system. According to estimates outlined in Figure 1, achieving a 2°C pathway will require US$8.8 trillion in incremental investment in energy efficiency between 2015 and 2030, in areas like buildings, energy-intensive industry and transport. Financial incentives and loan programmes can be useful as a policy tool to accelerate investment in energy efficiency (see Box 3). However, the lack or high cost of finance are not the only impediments to most efficiency improvements. Demand for energy efficiency is constrained by other factors, including lack of information, transaction costs, agency problems, mispricing and a host of other barriers discussed in the energy efficiency literature. Energy efficiency investments also tend to be intimately wrapped into the operations of a business or household, and therefore are often difficult to finance independently of financing to the household or business in question. Carbon capture and storage (CCS): Removing the CO2 from the exhaust gasses of fossil fuel fired power plants can be an important strategy for reducing greenhouse gas emissions from the power sector. As discussed in Chapter 4: Energy, there were 21 large-scale CCS projects in operation or under construction around the world as of February 2014. However, since the technology is currently more expensive than other technologies examined here, the financing policy challenges are not explored in this chapter. For the purposes of the next 5–10 years, financing of CCS is likely to be dependent upon research and public support schemes and therefore more of an issue for innovation, energy and climate policy than financing policy. Nuclear energy: Like CCS, nuclear energy development will likely depend on public support mechanisms in many countries. In addition, however, nuclear energy could benefit substantially from many of the financing and industry structure arrangements to be discussed below with respect to renewable energy. Transmission and distribution: As natural monopolies, transmission and distribution is generally owned and operated by regulated or government-owned companies. While the specific assets requiring investment, and even the business models employed, may shift substantially in a low-carbon transition, total investment will be slightly less than under a business-as-usual scenario. For instance, increased investment to connect new renewable sources will be offset by the impact of energy efficiency and distributed generation in reducing demand for centrally generated electricity. Thus, with appropriate system policy and design, current financing arrangements could work adequately for the near-term transition. Other associated infrastructure, including energy storage, information technology and advanced metering: The transition will require continued innovation across several technology areas, particularly on the demand side. In the near term, these are areas for continued innovation, as briefly discussed in Chapter 7: Innovation. Maintaining conventional generation during the transition: In many countries, the transition will involve phasing out the building of new coal- and gas-fired generation, and could reduce life extensions for many existing plants. Nevertheless, conventional generation will be needed for many years to support the transition: to provide ongoing energy to meet the demands of the economy; balance variable renewable power; and reduce the overall economic cost of a transition. In developing economies, some new conventional generation will be needed alongside low-carbon generation to support continued rapid economic growth. Thus, while investment needs for fossil fuel generation will decline, there will still be a need to ensure that this generation is financially viable. In developed countries, new capacity markets can value the flexibility and support that conventional generation offers, making these assets viable even at reduced output levels. 7 Further consideration will need to be given to the integrated utilities that may lose value in the transition, and find it difficult to support the required growth in transmission or distribution businesses. The main, near-term financing concern lies in the growth of renewable energy investment and, to a lesser extent, nuclear energy. While costs were relatively high and falling, it made sense to finance and operate renewable energy sources, such as wind and solar, through existing corporate and financial structures, minimising industry disruption while concentrating on cost reduction and initial deployment. Today in some markets, the average cost of energy from many renewable energy sources is approaching that of new conventional generation, when levelised over the life of a new energy project, as detailed in Chapter 4: Energy. In some cases, the cost of renewable energy is lower than for conventional generation. With lower costs, a faster, larger scale roll out is more feasible and attractive, but the arrangements that helped when deployment was relatively small are inefficient at a larger scale. The principal challenge many countries now face in financing low-carbon energy is therefore to reduce the cost of investment in low-carbon energy assets, and to identify mismatches between investor and finance needs. Solutions to these challenges are discussed in the following section. The initial investment is a higher proportion of total costs for renewable energy than fossil fuel energy, making the finance costs that spread these initial costs over the life of the renewable energy plant much more important. Many of these differences can be, and are, handled through policy. Feed-in-tariffs (FiT) or fixed price power purchase agreements (PPAs) can eliminate the price risk that would be experienced by a renewable provider attempting to sell renewable generation on wholesale electricity markets. Where these PPAs offer longer-term price guarantees – often up to 15 to 20 years or more – renewable energy projects can attract longer-term debt finance, which reduces the expected lifetime average finance costs for a project. Under current financing arrangements, extending the duration of a PPA by 10 years (say from 10 to 20 years) alone could reduce the average electricity generation costs over the lifetime of typical wind and solar projects by 11-15%, employing a FiT rather than a premium to wholesale prices can reduce costs by 4–11%. 8 As the cost of renewable energy approaches that of market prices, the benefits of these policies will fall slightly, but the benefits in reducing risks remain. There is, however, another impact of policy on financing. Uncertain or changing policy can raise risk perceptions and increase borrowing costs or even make it impossible to borrow against a project without some sort of explicit or de facto government guarantee. Without debt, the cost of finance can increase markedly. The following analysis of the impact of policy on financing costs assumes that projects are financed with the current industry structure and common project development arrangements. Typically, these projects are developed and owned by independent power producers and investor-owned utilities, and often use project finance to enhance returns to levels consistent with their business models. Investors in utility company shares expect certain levels of returns from their equity investments. Under current business and investment models, renewable energy returns have to rise to these expectations to make these investments attractive to utilities and to make utility shares attractive to the financial markets. Energy users seeking long-term price certainty for energy, or a hedge against volatile energy costs. As shown in Figure 2, solutions tailored to the investment needs of these types of investors could reduce the cost of renewable energy by up to 20%. Climate Policy Initiative modelling, based on interviews with developers and investors and Standard & Poor’s; company reports. Once development and construction is finished, renewable energy projects are relatively simple investments. There are no fuel costs to manage, operating costs are relatively low, output is fixed by wind or solar conditions, and revenues are also fixed, assuming a fixed, long-term price contract or feed-in tariff. As simple investments, these projects remain attractive investments even when returns are low, and with the right structural changes they can remain attractive at lower returns still. Utilities and IPPs have used project finance – where a stand-alone project company is formed that owns only the renewable energy project – to increase returns to levels more in line with what their shareholders expect from utility investments. Project finance increases returns by allowing the owner to borrow more money directly against the asset, without otherwise affecting the company’s finances. By borrowing more, project owners get their cash back earlier and thus enhance their returns. However, project finance can be expensive to arrange and banks charge higher interest on loans to project companies, thus increasing the cost of finance. Some utilities have responded by financing renewable energy on their balance sheets – that is, by borrowing against the entire company rather than just a specific project. Companies have lower debt costs than projects, since lenders have more assets to recover in case of default, and thus face lower risks. The lower debt cost would reduce the renewable energy costs by 6% for a well-financed utility. For many utilities, however, large renewable energy portfolios still offer lower returns than other investments, consume investment capital while producing little growth, and thus make the companies less attractive to investors. That is notwithstanding the fact that the very best renewable energy projects, including many wind projects in Texas and Midwestern US, have very good wind conditions that can make projects competitive over their lifetime. An additional, emerging problem with utility financing in Europe is that these companies are seeing falling revenues and profits, and many can no longer support additional debt. The essential problem is that renewable energy investments have financial characteristics that are more akin to corporate bonds than the typical utility investment. A utility would make no money borrowing at a bond rate just to invest in another bond with the same return. Packaged appropriately, in structures that look like bonds rather than utility company shares, and then selling the assets directly to bond investors could significantly reduce the cost of financing renewable energy. 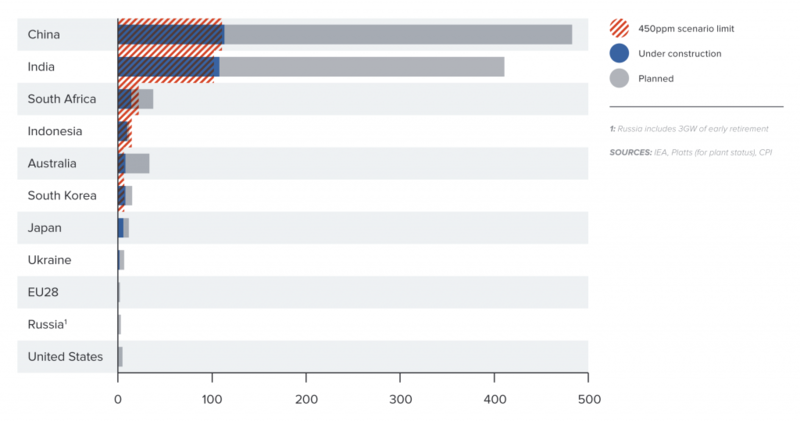 Another issue is that many current renewable projects investments are relatively “illiquid”. That is, investors tie up their money in the investment and cannot easily sell the assets if their circumstances, or those of the market, change, or can only do so with substantial transaction costs or loss of value. Illiquidity imposes a significant cost on institutional investors, if it makes them unable to react to new investment opportunities that may arise in the market. They may have to retain extra investment in secure, very liquid, but low-return investments such as government treasury bonds. Low-risk “YieldCos” could attract equity investment at costs 2% per year lower than traditional utilities. Other approaches such as securitisation of loans to renewable energy and covered bonds rely on standardisation and pooling for diversification and aggregation. These can also be appealing to institutional investors, which require large transactions and low transaction fees, high credit ratings, sufficient transaction data to assess risk and return, liquidity, benchmarks, and a defined asset category in which to invest. Institutional investors are also primarily interested in providing long-term debt investments that match their liabilities. Green bonds (described in Box 2) could be a promising vehicle for institutional investors if renewable energy projects can be standardised and securitised. The Climate Bonds Initiative and HSBC reported US$11 billion in green bonds were issued in 2013 — a marginal portion of the total global bond market, but one that is growing rapidly. 12 Institutional investors are very comfortable with bond investments. If green bonds can be used to finance renewable energy projects in a manner that delivers liquidity and high credit ratings (e.g. through pooling, credit enhancement, and securitisation) this may be a promising path for increased institutional investor investment in renewable energy. Financial markets tend to reward short-term over longer-term investment. Although they are long-term investors in theory, institutional investors often face short-term performance pressures which can prevent them from investing in long-term assets.17 Investment holding periods are declining among institutional investors, and allocations to less liquid, long-term assets such as infrastructure and venture capital are generally very low. As part of the liberalisation of gas and electricity markets, “unbundling” regulations have been set up to prevent investors from owning a controlling stake in both transmission and generation. This applies to renewable energy as well, and the OECD notes that given the attractiveness of transmission and pipeline-type infrastructure assets, “unbundling” regulations “may unintentionally force investors to choose between majority ownership in transmission and generation/production”. Similarly, the use of tax incentives may discourage investment by institutions that are already tax-exempt (such as pension funds in many countries), and instead can create a new class of “tax investor”, the OECD notes, “whose purpose is to accelerate the use of, and improve the value of tax credits, but whose presence can crowd out institutions”. “Capital adequacy” rules designed to increase banks’ levels of capital and reduce their exposure to long-term debts can also discourage long-term investments, including green infrastructure investments. (Examples include Basel III for banks around the globe, and Solvency II for insurance companies in Europe.) In addition, the OECD notes, certain accounting rules that are meant to increase transparency and consistency in financial statements – such as fair value or mark-to-market accounting – can be hard to apply to illiquid investments with long holding periods. There are policy initiatives underway to attempt to re-orient the financial sector toward longer-term, lower-carbon investments, including the United Nations Environment Programme (UNEP) Inquiry on the Design of a Sustainable Financial System. 18 A number of banks have made statements on the value to investors of taking a longer-term perspective or considering social and environmental risks. However, implementation of these principles has been sparse to date. Financing costs are crucially important in keeping down the cost of infrastructure, given the high upfront investment. As discussed in Box 1, there are presently financial market barriers that restrict or raise the cost of finance to infrastructure. A number of different financial instruments address this challenge, by attracting institutional investors. Infrastructure bonds are primarily used in the project finance of infrastructure assets. Through these bonds, institutional investors can gain direct access to long term, steady, low-risk investments. Bank deleveraging and Basel III capital restrictions have limited new investment from banks. Infrastructure bonds and other vehicles below here have the potential to fill the void by attracting institutional investment. Green bonds are a type of infrastructure bond that provides debt to a project or a portfolio of projects that are certified as being environmental or “green”. The green character is the key enhancement over infrastructure bonds. By being green, these bonds may be able to access investors who prefer green investments or have restrictions or limitations to non-green investments when debt is scarce. By creating a distinct market and through competitive forces, green bonds could lower the cost of environmental infrastructure projects. Corporations and governments have also issued green bonds to back low-carbon projects, using their institutional creditworthiness to bring down financing costs for the projects. YieldCos, which own portfolios of low-risk, long term projects are equity vehicles that can go a step further than infrastructure bonds by effectively bundling equity and debt together in one package. By bundling projects together, the project finance premium for single projects can be avoided. Moreover, for a portfolio of projects with risks comparable to corporate bonds, the result for investors can be a higher-yielding, bond-like instrument that nevertheless reduces the overall financing cost for the projects in question. Municipal bonds can serve the same purpose for renewable energy as YieldCos – that is, using high leverage for a project while keeping debt and equity costs down – if a municipal government is willing to bear the equity risk and role of investor itself. Although the sophisticated financial systems of developed economies can cultivate innovative solutions to financing problems, they need an investment case to do so. The unfamiliarity and risks of new financial products can prevent their development, but, once the market is established, risks fall and financial actors join the market. In this context, national infrastructure banks can develop credible markets that will eventually bring in private capital. Creating appropriately designed YieldCos: Although YieldCos, as discussed above, are gradually entering the market, their design is not perfectly aligned with institutional investor needs. A government infrastructure bank could take on this role and develop the new, appropriately designed, asset class. Lending to small-scale distributed generation and energy efficiency projects: Infrastructure banks could extend loans to de-centralised, customer-generated electricity and energy efficiency projects with marginal credit risks, creating business opportunities both for the private sector and low-carbon investment. Examples of these programmes are discussed in Box 3.
Financing infrastructure that needs scale for rollout: As an example, an infrastructure bank could lead investment in electric vehicle (EV) charging infrastructure, an investment that is difficult for individual actors to make due to scale up and timing issues, but one with significant public benefits. The timing issue refers to a “chicken and egg situation” where widespread EV adoption requires a charging infrastructure in place, but without EV users charging infrastructure will fail to generate revenues. Providing early-stage deployment support: An infrastructure bank could take on some early-stage risk to accelerate deployment of newly emerging technologies that drive infrastructure productivity. Supporting local municipal governments and aggregating small-scale projects to attract cheaper capital: Securities backed by pools of diversified small-scale clean energy loans can attain much greater cash flow certainty than individual projects, making them attractive to institutional investors. Building such projects portfolios have to acquire a certain scale, however, where a government infrastructure bank can provide initial support for example through first-debt loss guarantees. Green investment banks can be effective tools to mobilise domestic private finance and investment in low-carbon infrastructure. Green investment banks have been established at both the national and sub-national levels. 22 Many have leveraged private capital, and engaged with institutional investors in a number of ways including: taking cornerstone stakes in funds or vehicles that attract pension and insurance capital; providing debt financing; issuing green bonds; or designing products that have stable long-term cash flows which will be attractive to long-term institutional investors. Some green investment banks have a particular focus on financial sustainability and demonstrating that low-carbon investments can be profitable. The UK Green Investment Bank expects to earn taxpayers an average return of 8% per year, with every investment on track to make a profit.23. At the national level, green investment banks can be effective tools to mobilise domestic private finance and investment in low-carbon infrastructure when existing institutions are not already fulfilling this role. Some Public Finance Institutions (PFIs), such as Germany’s KfW, already have an explicit mandate and authority to invest in green infrastructure – often with established guidelines on which technologies or markets to address. “Greening” existing PFIs, where there is the necessary institutional and political support, might be preferable to creating new institutions. Apart from their role in funding and directing national infrastructure banks, governments also invest in low-carbon infrastructure themselves, both via direct investment and via companies that are fully or partially owned by the government. Source: Berlin et al., 2012; Booz&co, 2013; Clean Energy Finance Corporation, n.d.; Critchley, 2014; Export Development Canada, n.d.; Gutscher, 2014; Hawaii State Energy Office, n.d.; Kidney, 2014; Moore and Morrow, 2013; New York Green Bank, n.d.; Parliament of Canada, n.d.; UK Green Investment Bank, 2014; Wee, 2013. Increasing energy efficiency is a key part of developing better energy systems. Improving energy efficiency in buildings and energy-intensive industries accounts for US$5.3 trillion of the US$8.8 trillion of incremental investment in energy efficiency from 2015 to 2030, laid out under the low-carbon transition scenario in Figure 1. Efficiency is particularly important for those countries whose growth is constrained by unmet energy demand. Energy efficiency poses specific financing challenges. Achieving investment at the scale needed will require new policy and financing vehicles. While many energy efficiency investments generate substantial savings relative to the initial investment, few projects are large enough to attract the attention of financiers. Energy efficiency projects generally offer poor collateral, for example improvements to a building’s shell have little value if removed and resold. Credit risk is the principal driver of financing costs for most energy efficiency projects, and that risk – being uncollateralised – is substantial enough that interest rates for small commercial and residential consumers are relatively high. In developing countries, where credit-based lending is rare, energy efficiency financing is often not available for small-scale borrowers. Even lending to large industrial actors with collateral is restricted to five years or less. Moreover, it may depend on targeted lines of credit financed by international institutions, such as the International Finance Corporation (IFC) and the European Bank for Reconstruction and Development (EBRD), both of which have prioritised funding for private–sector energy efficiency investment. Despite these difficulties, private-sector interest in energy efficiency financing is growing, with new business models emerging that shift risks in helpful ways. Public programmes that add security to investments by tying them to utility bills, mortgages, or property tax assessments may lower rates from financiers. Sales of securities backed by energy efficiency loans have begun to emerge, potentially making energy efficiency lending more liquid and attracting cheaper capital. The HERO programme started in Riverside County, California demonstrates the potential benefits. With repayments secured on property tax bills (and therefore senior in obligation to mortgages), private lenders have provided more than US$200 million in capital for efficiency and distributed renewables in residential and commercial buildings. One capital provider has securitised and sold bonds backed by the loans to raise additional capital. Demand has been strong and over 100 California municipalities have now joined the programme. Most financial programmes, even those that offer substantial concessions, have struggled to motivate customers. The extent to which improved financing drives project uptake has not been well studied, and may vary substantially in different markets. That said, the approach clearly offers potential. Renewable energy can play a slightly different role in rapidly developing, middle-income countries. First, rapid growth creates a thirst for new energy sources to meet growing demand. Thus, competition for renewable energy comes from new plants that are yet to be built, rather than already existing facilities, as may be the case in developed markets. With good renewable resources, renewable energy could already be competitive, and in some cases, renewable energy might even have an advantage given the infrastructure that may be needed to support large-scale, centralised coal-fired generation. Second, the potential role of renewable energy is especially important in boosting energy security and improving balance of payments compared with importing coal, oil or gas. Third, some developing markets have viewed the manufacture of renewable energy equipment as a potential national strategic objective. To meet these goals, many middle-income countries have adopted policies and incentive schemes also used in developed markets, such as feed-in tariffs, power purchase agreements, auctions and green certificate markets. A distinguishing feature of some middle-income countries which can alter the effectiveness of these types of policies is their greater cost of debt. Middle-income countries tend to grow faster than high-income ones. Growth creates competing investment needs, particularly for infrastructure, and it can also lead to inflation. The result is usually higher interest rate environments than in slower-growing developed countries. Additionally, generally younger populations and less well-developed pension and insurance industries limit the pool of long-term, relatively low-cost investment available for infrastructure. Thus, in middle-income countries low-carbon energy may suffer in two ways. First, since low-carbon generation is often more capital-intensive than fossil fuel generation, higher interest rates and low debt availability have a greater impact. Second, since fossil fuel is often priced in dollars and has access to global markets, it can be financed on international rather than domestic markets. Yet for the developing country itself, renewable energy is often a direct substitute for the fossil fuel, replacing imported coal, gas or oil, and reducing foreign exchange requirements that go along with fossil fuel imports. Renewable energy is often a direct substitute for fossil fuel, replacing imported coal, gas or oil and reducing foreign exchange requirements that go along with fossil fuel imports. For developing countries there are a number of financial mechanisms that can bridge the difference between the high cost of financing in local currency and the benefits that should be priced in hard currency. Countries such as China and Brazil effectively use subsidised, low-cost debt to finance renewable energy. National development banks, national sovereign wealth funds and investments made from national budgets or state-owned enterprises (SOEs) under administrative direction fund substantial percentages of the world’s low-carbon investment, overwhelmingly in their own domestic markets. The accomplishment of state banks in funding low-carbon energy at tolerable debt rates is substantial. In China, it may be that the combination of China Development Bank debt, SOE equity funded by retained earnings, and secure power purchasing agreements in administered markets creates the functional equivalence of municipal finance, energy user finance or YieldCos in high-income country, market-based finance systems. However, it is important to note that there are active reform movements in China, Brazil and other middle-income countries with strong development banks that would liberalise the existing financial system, changing the supply of low-carbon debt financing. Middle-income countries often pay as much for renewable energy as the US and Europe, and sometimes much more, despite potential labour, land and construction cost advantages. Middle-income countries such as India, Mexico, South Africa and Morocco use a variety of national niche and multilateral solutions to finance low-carbon projects, but are constrained by an absence of low-cost debt necessary for such capital-intensive investments. In this analysis, those countries are labelled as MIC2, in contrast to middle-income countries with access to low-cost debt through development banks, such as Brazil and China (MIC1). MIC2 countries often pay as much for renewable energy as the US and Europe, and sometimes much more, despite potential labour, land and construction cost advantages. 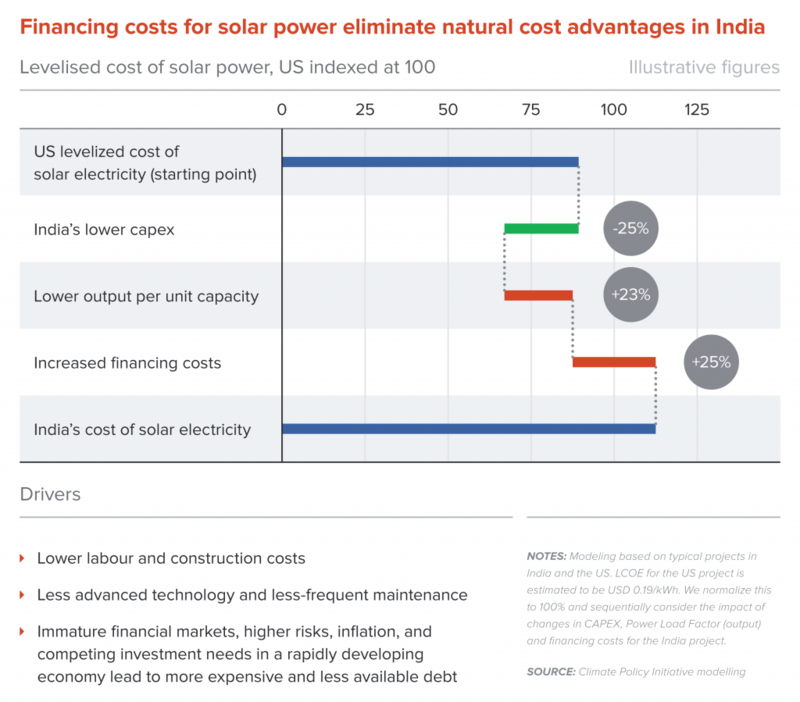 Figure 3 shows how increased financing costs could impact a typical Indian solar project. Lower initial capital expenditures for this plant were almost 25% lower than a US counterpart. Less advanced equipment, lower solar radiation and dust were expected to decrease its output, but even then, costs were slightly lower than in the United States. However, financing costs due in large part to wider capital market factors in India, pushed lifetime cost per unit of energy well above the US counterpart. The high cost of debt creates other problems. Policy solutions such as stable long-term contracts or reliable feed-in tariffs can reduce the cost of renewable energy in other countries by allowing a larger share of a project to be financed with debt, which carries lower financing costs than equity. But in many rapidly developing countries, the cost of debt is so high that there are virtually no savings to be gained by growing the share of debt in a project. As a result, those same policy solutions are much less effective at bringing down renewable energy costs and driving deployment. 34 More expensive debt can limit the availability of upfront equity capital, given uncertainty over the cost of refinancing the completed project. Developers may not be willing or able to refinance completed projects with debt. Discussions with stakeholders in India reveal that the difficulty in securing debt may already be causing developers to run out of equity to invest in the next set of projects. High debt costs are not unique to renewable energy. Rather, they reflect the high interest rate environment, which itself reflects the higher inflation, large infrastructure needs, heavy government borrowing, and a less developed financial system typical of rapidly growing economies. One option would seemingly be to use lower-cost debt from developed markets. The first question is, then, whether the loan should be denominated in, say, US dollars, or in the local currency. If it is denominated in US dollars, then the borrower must take the risk that the local currency falls and the debt becomes much more expensive. The lender will likely refuse to make this loan because the default risk associated with unfavourable currency movements will be too high. Alternatively, the loan could be priced in local currency, but then the lenders need much higher interest rates to compensate them for the currency risk. As a result, most loans require currency hedges that convert one currency to another over the life of the loan. In fact, unless they have offsetting liabilities, most dollar investors require hedges for euro investments and vice versa. Hedges cover relative currency movement risk that results from differences in inflation, economic growth, government policy, and so forth. The cost of these hedges depend on market conditions, trade flows and relative country risks, but often they can take up all of the difference in interest rates between dollar-based loans and local currency loans. 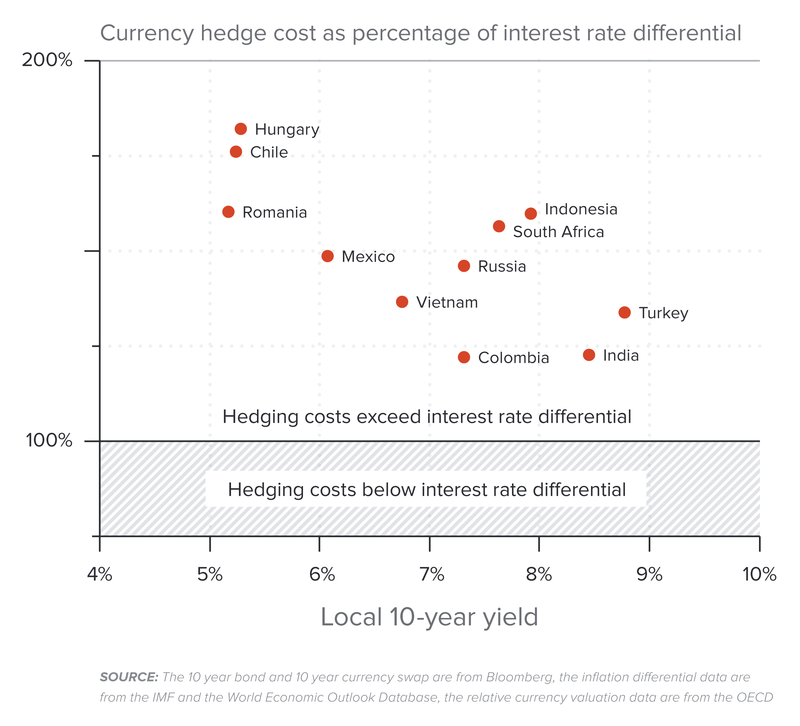 In fact, Figure 4 shows that as of January 2014 the cost of hedging for a number of developing countries was 20–80% higher than the difference between base interest rates in each country. In other words, foreign debt that was fully hedged against currency risk would have been more expensive than local debt, meaning that foreign debt is not a viable option for renewable energy project in these economies. Source: Data from Bloomberg, n.d.; IMF, 2014; IMF, n.d.; OECD, n.d.
International Monetary Fund (IMF), 2014. World Economic Outlook Database 2014. Washington, DC. Available at: http://www.imf.org/external/pubs/ft/weo/2014/01/weodata/index.aspx. One solution for MIC2 that does have promise for increasing scale is national or local debt subsidies, which can reduce the total cost of subsidising renewable energy. Analysis for this report shows that if debt were available at terms and interest rates similar to those found in developed countries, the cost of renewable energy would be as much as 22% lower. 35 Debt subsidies can be used alongside feed-in tariffs or power purchase agreements, partially or wholly replacing the subsidy element within these mechanisms. Modelling conducted for the Commission shows that this switch could reduce the total cost to government and energy consumers of subsidising renewable energy, including the cost of the debt subsidy, by up to 30% for the same amount of renewable energy. Lowering debt costs can allow the government to support greater renewable energy deployment with scarce subsidy resources, compared to providing the same rate of subsidy through higher guaranteed revenues. A key challenge for incentivising renewable energy through concessional debt will be the administration of the debt and selection of projects. These arrangements must allow project developers to receive adequate incentives while ensuring that the value of the lower-cost debt flows through into lower energy prices. Project selection mechanisms must also target the most economic projects, to minimise inefficiencies through poor project selection including failed projects. Many countries already have institutions which can perform part of the task, such as renewable agencies, energy ministries, treasuries or development banks. But careful design will be needed to ensure efficient project selection and development in coordination with national energy policy. In some cases, multilateral development banks may be able to help build the necessary institutions. In other cases, existing institutions may serve as a conduit for multilateral financing. Once these arrangements are in place, projects that receive concessional debt in lieu of subsidies should remain just as attractive to developers, while costing 30% less in terms of subsidies from governments or higher tariffs from consumers. Rapidly developing, middle-income countries are in the process of quickly expanding their energy supply systems, and niche solutions for MIC2 countries abound, but need scaling up. Examples of such creative niche solutions include private wind parks to supply off-grid power to high value firms in Mexico and India, which are willing to pay extra for a more secure electricity supply and can finance the project off their own balance sheets. Another is the case of large conglomerates which can access low-cost debt from commercial banks with which they have long-term relationships. A third is concessional financing from multilateral trust funds like the World Bank’s Clean Technology Fund for early vintage concentrated solar plants in India, South Africa and Morocco and geothermal plants in Indonesia. Still, these solutions are, at the moment, limited in scale and do not compare to levels of low-carbon investment financed in high-income countries and MIC1 nations. As discussed in Chapter 2: Cities, cities are likely to play a central role as drivers of low-carbon economies and low-carbon growth. Municipal financing is a common instrument to finance public transportation and efficient city infrastructure, and analysis in this chapter suggests it is also a useful vehicle for investment in renewable energy and energy efficiency. But in many countries, cities have limited authority to make decisions on major infrastructure investments. They also have limited financial resources and may not be able to provide sufficient collateral to finance investments themselves. In order for cities to be able to deliver on the recommendations in this report, it will be necessary to resolve these issues of authority and financial resources. Further work is needed to better understand these challenges in each nation, and to develop financing vehicles that provide security for investors while helping low-carbon cities grow. DFI’s can provide a layer of risk protection and capital cost reductions beyond what can be provided by host governments. Historically, international concessional financing has formed a substantial share of financing in low-income countries. Official development assistance in low-income countries averaged 54.9% of gross capital formation in 2012, 37 and those with lower GDPs had even larger shares of foreign assistance. Concessional loans are known to be an effective tool to support governments in the development of large projects that might not garner private sector participation, such as large hydropower plants or binational/regional high voltage transmission lines to transport electricity from renewable sources. Equity and non-concessional loans can attract the private sector to invest equity and debt in utility-scale renewable power generation plants. The return on equity and the financing cost of the loans of DFIs are similar to private-sector investors and so do not directly reduce financing costs. However, the participation of DFIs as co-lenders or equity partners is regarded as positive with respect to reducing regulatory and other risks, and so still attracts private investors. Both bilateral and multilateral external development finance has a positive and significant effect to mobilise private finance flows to developing countries. The same analysis shows that raising the ambition of domestic policies in developing countries to incentivise renewable energy investment, such as through feed-in tariffs and renewable energy quotas, is vital to attracting private investment at scale. Evidence shows that external official development finance operates on at least two levels to support green investment: first, to directly attract private co-financing and investment for green infrastructure; and second, to work with MIC governments to support policy reform processes and build local capacity and conditions so as to make green investment viable in the longer term. 39 Delivered through bilateral or multilateral development co-operation channels, external official development finance often has a catalytic role in shifting and scaling up green investment. In addition to direct equity and debt investments in infrastructure projects, DFIs offer risk-bearing instruments for investors in MIC2 and low-income countries, such as insurance protection and guarantees. With additional improvements and innovation, these instruments, could help address finance needs for low-carbon assets at larger scale. While these are useful steps forward, there are still significant gaps in the supply of instruments to address these risks. Existing instruments (such as those offered by MIGA and OPIC) have costly compliance requirements, which limit their application to large and well-resourced projects only. They may also not be fully visible under international official development assistance accounting rules, which measure assistance on a cash flow basis. Because these instruments are largely unaffordable for smaller projects and programmes covering widespread, small-scale installations, 41 due to high costs as a result of complex negotiating and drafting processes, other dedicated programmes are needed to seek justice locally and keep investments solvent before compensation is paid. A number of factors have limited a more widespread adoption of partial risk guarantees, which have only been issued 23 times since their inception and eight times for renewable energy projects. 42 The World Bank has in the past promoted the use of partial risk guarantees mainly for large and complex projects, such as large hydro investments and cross-border projects, and required an indemnity agreement from the host government. This has increased a market perception of product complexity, lengthy procedures and high transaction costs. Furthermore, partial risk guarantees directly cover only debt holders, while tariff reductions usually affect many other parties including equity owners, providers of operations and maintenance services. This last issue can be addressed by complementing the instrument with other insurance tools and guarantees, such as MIGA insurance, albeit at increased complexity and transaction costs. MIGA aims to provide compensation within six to 14 months following the date of loss. 43 Historical evidence made available by the Agency 44 shows that so far claims have been paid after two to three years from the event date, and no later than one year from the date of claim’s submission. OPIC data based on 13 available observations, from a total of 70 projects determined under total expropriation clause, show that claims are resolved on average 3.5 years after the event date and 1.5 years from the submission of the claim. Timing of the reimbursement process is uncertain and varies significantly from case to case. These delays and uncertainty have a large impact on the viability, and the perception of viability by investors, of these schemes. Guarantees are another financial instrument offered to reduce and mitigate investment risks. They are mostly offered by the World Bank and have proven to be an effective tool to attract private investment to the energy sector. Guarantees are particularly well suited for use in MIC2 and low-income countries, as they are focused on reducing the risk associated with payments due from governments or state-owned enterprises to investors (equity or debt) under contractual or regulatory commitments. These payments can be of a diverse nature such as those due monthly under a power purchase agreement, payments due as compensation resulting from a change in law, or payments due from SOEs under loan agreements with commercial banks. The World Bank has approved 19 guarantees in the past three years for an aggregate amount of US$2.9 billion. 45 These guarantees have enabled US $11 billion of investment, mostly in the energy sector, in highly challenging markets such as Cameroon, Ivory Coast, Kenya, Mali, Mauritania, Nigeria, Pakistan, Senegal and Uganda. Across low-income countries (LIC), even those now exporting oil and other natural resources, the challenge of capital mobilisation for investment in energy assets, whether low or high-carbon, is still very severe. Infrastructure investments typically depend on government involvement in the form of partial ownership, subsidies or credit guarantees, or contracts with a government-owned utility. As in all countries, a stable regulatory system and enforceable, long-term power purchasing contracts is a major component of an investment case. However, lack of government credibility and/or financial capacity is a potential barrier for investment in infrastructure assets. Given the lack of long-term domestic or international private capital for these classes of investment, multilateral banks and development finance institutions, including the Global Environmental Facility, the Green Climate Fund, and the United Nations Framework Convention on Climate Change (UNFCCC) Adaptation Fund, continue to play a central role in financing infrastructure in low-income countries. New initiatives, funding vehicles and programmes, special purpose funds and institutions with particular dedication to low-income countries energy provision are expanding. The extra up-front capital costs of low-carbon energy present a challenge to the multilateral banks, given many other demands on their balance sheet capacity. Fortunately, new initiatives, funding vehicles and programmes, special purpose funds and institutions with particular dedication to low-income countries energy provision are expanding. Examples include innovative distributed, off-grid energy solutions such as community-inclusive local area networks, anchored on an agricultural or mining producer with substantial base demand, or small-scale mechanisms such as prepayment cards as used in mobile telephones or securitised microfinance. Multilateral platforms such as the Green Climate Fund, Sustainable Energy for All, and the Climate Finance Innovation Lab assign leading emphasis to the particular demands of low-income countries, including funding adaptation and the design and implementation of specific equity funds, project development facilities and the private refinancing of multilateral banks’ energy development budgets. Finally, it is worth noting the growing significance of funding of energy infrastructure in low-income countries by Chinese development banks (see Box 5). At the moment, the majority of investment in infrastructure in developing and emerging markets is provided by the public sector. Given the budget constraints faced by these countries, and the projected needs, the private sector will need to participate more strongly in the future. Private-sector money is not flowing to developing and emerging countries at the pace and scale required. Political risk, macroeconomic instability, lack of well-developed projects all contribute to the reluctance of the private sector to invest. While the total subscribed capital of these institutions is not insignificant, it is still fairly limited in comparison with the International Bank for Reconstruction and Development (IBRD), at about US$200 billion, or the Asian Development Bank, at about US$160 billion. The real potential of these institutions derives from their shareholding, formed by key emerging and developing countries, and their focus on infrastructure. This puts these new institutions in a strong position to leverage and blend their finance with national development banks and funds, such as the China Development Bank or the Brazilian National Development Bank (BNDES), both able to mobilise substantial investments. Some smaller regional development funds, such as the Development Bank of Latin America (CAF), are also increasingly influential. With one of the highest credit rating of debt issuers in Latin America (AA-), the CAF is now lending more than the World Bank and the Inter-American Development Bank together in the Latin American region. As developing and emerging countries’ domestic financial markets deepen and savings are increasingly recycled through their domestic banking system, these new banks and funds will be in a strong position to blend their finance with private sector funds. An important question is to what extent these institutions will recognise the opportunity to invest in infrastructure that lays the foundations for a more sustainable, low-carbon future, particularly when investing in energy infrastructure. The nascent Green Climate Fund, which is meant to provide global climate change finance in the context of delivering on the commitment of mobilising US$100 billion a year by 2020 to support emerging and developing countries on adaptation and mitigation options, can play an important role in blending its finance with other infrastructure funds. While US$100 billion is a small part of the total financing needs for sustainable infrastructure, and can be raised in rich countries through current and future fiscal instruments, used wisely these funds can be a catalyst for further public and private funds. Using innovative financial instruments to address multiple issues including policy risk and affordability of infrastructure in poorer countries, will be key for these institutions to invest at scale in sustainable infrastructure. BRICS countries have explored how their new bank could support sustainable infrastructure, but the outcome will only be clear once the bank starts lending at scale. While the emerging strategies described in the previous section can reduce the cost of capital and increase the availability of finance for a low-carbon energy transition, these measures by themselves would not achieve the full investment necessary to reach an ambitious climate goal, often benchmarked at a 2°C rise in global average temperatures. The Commission therefore decided to explore just how much additional capital might be required to achieve this goal and what impact that those additional capital needs could have on global finance. The headline financial impact of the low-carbon transition is the incremental investment required. Incremental investment is important because it can describe how much of the available global investment capital would need to be “crowded out” and shifted to the low-carbon energy investments. If, for example, a doubling of investment into the power sector were required (relative to a “business as usual” scenario), it would be hard to reconcile this with the imperative to grow global energy supplies in an affordable way. But incremental investment tells only a part of the story. Operating expenses: Capital investment will replace some operating expenses freeing up cash for further investment. For example, wind turbine investment reduces the cost of transporting coal from mine to power station. The money saved in transportation would then be available for investment elsewhere in the economy. Asset life: Both high and low-carbon energy systems have a mix of long and short-term assets. In general, the average life of the assets of a low-carbon system is slightly longer, particularly when considering the short amortisation periods of some upstream fossil fuel assets. Longer-life low-carbon infrastructure may require more initial investment, but will delay future investment to replace capacity. For example, an investment made in 2025 with a 20-year life will still have half of its production remaining in 2035. Risk and required return: Lower-risk assets require smaller incentives to meet a given return. Investors in a project could require double or more incentive – that is return – to invest in a riskier project. Reducing risks in the energy portfolio could free risk capital to invest in risky, value producing, ventures elsewhere in the economy. Stranded assets: On the other side, a low-carbon transition can create “stranded” fossil fuel assets which lose value when they are no longer needed. Valuable assets can be used as security for future investments, so such a loss of asset value can take value directly out of the potential investment pool. The next section analyses the required incremental investment in a low-carbon transition, with an initial estimate that is then adjusted according to the wider influencing factors described above. The IEA uses a number of models and analyses to estimate future energy investment needs. Included in these estimates are scenarios that reflect current perspectives on “business-as-usual case” investment needs and scenarios with substantial carbon abatement, including the IEA’s 2°C scenario, or “2DS”. Both scenarios define the investment requirements for: power generation (fossil fuel and low-carbon power generation, plus transmission and distribution), building energy efficiency, industry (energy efficiency and other measures), and transportation (vehicles and mass transportation). They exclude the upstream energy investment requirements in oil, gas, and coal and non-energy infrastructure investments (roads, railways, bridges, agriculture, etc.). The difference between these two scenarios is an estimate of the incremental investment required to achieve substantial carbon abatement. It is only an estimate, since there are multiple possible scenarios, with very different investment implications. Nonetheless, the IEA investment figures provide a credible starting point from which to evaluate the impact of a transition on financing and financial markets. Analyses that specify less ambitious climate goals, for example to stabilise atmospheric greenhouse gases at 500 or 550 parts per million, could reduce substantially the incremental costs incurred by low-carbon systems and associated value stranding. However, the analysis of what such less ambitious transitions would mean for the average cost of capital, how these costs were distributed, and what political reactions might be expected would be logically similar. During that time, however, the world economy will grow substantially, and investments will be made in a variety of forms of capital stock. Analysis for the Commission shows that roughly US$400 trillion of new investments will be made into fixed capital (that is, total global investment in the economy) over the same time period. This is based on World Bank data on the historic ratio of Fixed Capital Formation to GDP, and OECD projections of GDP growth. In comparison, the above IEA estimates imply that the total investment needs for energy are 9% of fixed capital formation without taking any climate action, and 12% including the extra costs of low-carbon investments. While these are significant additional capital requirements, our assessment is that 3 percentage points additional investment in energy, as proportion of total investment, is modest relative to the overall scale of capital formation likely to occur over the next 15 years. The challenge will be to generate the required quantity of attractive investments, through technology improvements and supporting policy, and to direct available sources of capital into such investments. Table 2 breaks down incremental cost for a 2°C scenario for high-, middle-, and low-income countries. Earlier we outlined how incremental investment needs to be adjusted for operating expenses, asset life, risk and stranded asset to assess the full financial impact of an energy transition. Figure 5 makes this adjustment for one of the key components of the transition, the transition in electricity to move to low-carbon energy to replace fossil fuel-fired generation. This analysis is based on a comparison of the IEA’s business-as-usual and 2°C (2DS) scenarios, as well as additional market and financial analysis undertaken by the Commission. As such, it represents just one example of how low-carbon investment needs would translate into an actual financial impact on the economy. Many different paths could be taken to a low-carbon future, and the Commission believes that policy-makers will follow this type of analysis in evaluating policy paths for a low-carbon transition. As shown in Figure 5 (“Increased Low-Carbon Expense”), our analysis shows that US$2.8 trillion50 of additional capital will be used, or amortised, between 2015 and 2035 for renewable energy, nuclear energy, carbon capture and sequestration and transmission under the IEA’s 2DS scenario compared to business as usual. Our analysis also indicates that by the end of 2035, an additional incremental US$4 trillion of low-carbon assets (not pictured) would have been invested and be on the books and available for continued production after 2035. Thus, although US$6.8 trillion of capital is invested, only US$2.8 trillion of this capital is amortised during this period. Amortisation is lower than total capital investment during this period because amortisation is spread out over the entire lifetime of the asset. The incremental costs of operating the additional plants, including nuclear fuel, will consume an addition US$1 trillion between 2015 and 2035. These estimates are based on the IEA investment paths, and on Commission modelling for upstream gas, oil and coal, based on commercial databases, including the Rystad oil and gas production economics database and a variety of industry and government data sources (see the discussion on stranded assets for further detail). Table 3 shows an application of various return and amortisation assumptions to different types of investment, based on industry and company analysis. Coal mining is less investment-intensive than low-carbon energy, but it requires substantial operating costs to mine the coal and transport it to the power station where it will be used. Coal-fired power stations themselves also have higher operating expenses than comparable renewable energy generators. Our analysis shows that reducing coal and gas consumption in power plants will avoid about US$1.7 trillion of capital investment from 2015-2035 (and avoid a further US$2.8 trillion on the books in 2035). Meanwhile, operating expenses – excluding fuel use in power plants which is already accounted for in the fuel production expenses – will fall by US$5.5 trillion. Thus, while the transition will consume US$1.1 trillion more capital during the period, total costs, after including amortisation and operating expenses, actually fall by US$3.5 trillion. However, the story does not end there, for assets require investment returns — that is, they incur financing costs — based on the entire value of the investment, not just the portion that is used (amortised) during a given period. The total amount of investment will be much larger for the low-carbon asset group, and therefore financing costs are higher as well. Nevertheless, the differences in returns required are not as large as the differences in total investment because the low-carbon assets are generally lower-risk than the high-carbon assets they replace. While fossil fuel generation technologies are well-established, fossil fuel investment must still manage substantial risks across the supply chain, including exploration and transportation of the fuel. The riskiness of fossil fuels can be observed in their historically volatile prices. Fossil fuel power-generating assets are exposed to this risk, as fossil fuels have to be purchased as inputs. This is particularly true when the fossil fuel generator is participating in a competitive electricity market and is not guaranteed a fixed return for the power it sells. Renewable energy investments, by contrast, are not exposed to volatile inputs, and deliver electricity over the life of the investment at low operating costs (up to 90% of the total cost of a wind or solar plant is in the initial investment) and with a high degree of predictability. Thus, renewable energy sources can supply electricity at lower risk, if not at lower cost, than fossil fuel generators. Whether the inherent low risk of renewable energy translates to a low cost of capital depends on the policy and market structures in place. If renewable energy generators participate alongside fossil fuel generators in a competitive market, they will receive a market price based on fossil fuel costs — and will still be exposed to fossil fuel price risk. However, if renewable energy generators can sign long-term contracts to provide power to a credible off-taker, they are not exposed to fuel price risks. 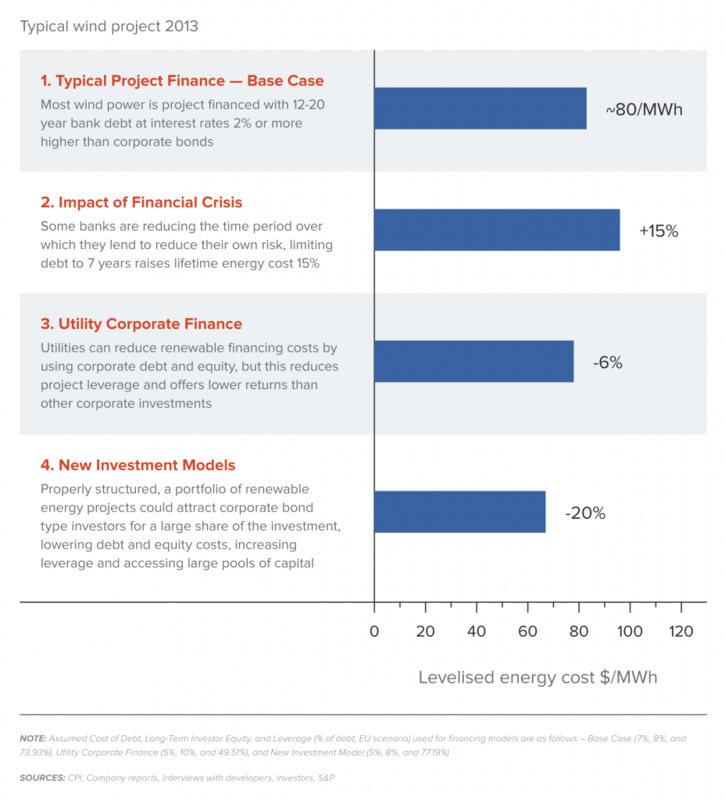 The lower risk of renewable energy sources could lead to lower overall financing costs as equity investors require a lower rate of return, and more of the total investment can be financed through debt. The lower financing costs reduce energy prices and free capital for savings and investment. From the investor side, relatively risk-tolerant capital is then freed to invest in new businesses elsewhere in the economy. Once the incremental cost and relative risk of investments is considered, modelling for the Commission suggests that the transition will require US$600 billion of additional investment return to investors over the twenty year period. Stranded assets are the final piece. Owners of fossil fuel assets would find that the value of their assets might fall in a transition. Valuable assets and the cash flows that they generate are used to underpin future investments. Reducing the value of these assets removes investment potential from the economy. Unlike capital and operating expenses, declining asset value does not represent a cost, but a one-time hit to the financial system. Therefore, this investment loss to 2015 was discounted to reflect the impact on the system. 51 For the power transition, asset stranding – or the decline in asset value which reflects potential reduced prices for ongoing production, as well as delayed or curtailed production resulting from the transition – is estimated at approximately US$1.1 trillion. Coal mining investments comprise the majority of lost value, with gas production assets accounting for a smaller part of the impact. The impact on power plants is relatively small, as there are available policies to manage coal plant stranding risk. We believe that this US$1.1 trillion is likely to significantly overstate the impact on financial markets as valuations currently seem likely to reflect some action towards reduced fossil fuel use, as discussed in Box 6. Summing the above calculations, after accounting for the cost of finance and the one-time cost of asset stranding, the analysis shows that the transition would have a net financial benefit of about US$1.8 trillion. However it should be noted that this is based on just one scenario, and that the IEA scenarios assume a significant increase in energy efficiency in the 2DS. The analysis has not attempted to value either the investment or operating costs of energy efficiency, except to note that much energy efficiency, if it can be achieved, has a net financial benefit, some, but not all, of which is reflected in the US$1.8 trillion figure. The electricity transition is not the only one that involves a trade-off between higher capital expense, lower risk and lower operating costs. The same story plays out in an oil transition to higher electric vehicle penetration, fuel substitution, more mass transit and higher efficiency. In this case, the analysis again used a combination of the IEA 2DS and business-as-usual scenarios with modelling for the Commission. It was found that a combination of lower operating costs, savings from reduced oil production, refining, transport and fossil fuel powertrains, and lower price risk almost entirely offset the higher capital investment, compared with the business-as-usual scenario. In total, before considering stranded assets, the global transition would cost around US$750 billion cumulatively for 2015–2035. Regarding asset stranding, oil supply and demand curve modelling and analysis were used to demonstrate the impact of different policies. The impact of the transition on consumers as well as producers and the government was explored. The impact that lower demand would have on benchmark, wholesale oil prices is far more important to producers as a group than lost production. But when prices fall, consumers benefit. The net cost or benefit to the economy is the net of costs or benefits to producers, consumers and government tax receipts. The result depends on the chosen policy. If customers lose value through reduced consumption or from being forced to switch transport due to costs – for instance through higher consumption taxes – the economy loses out because of consumers’ loss of value. However, if innovative new and lower-cost transport options – perhaps developed through innovation policy – attract consumers away from oil-based transport, the economy wins. Including all of the cost elements, a purely tax or cost-based policy would cost the economy US$2.5 trillion over 20 years while pure innovation would save US$3.5 trillion. In practical terms, a mix of policies will be needed as higher prices are a major spur to innovation and tax receipts can be used to invest in innovation. Meanwhile, the more successful innovation is, the lower taxes will be needed to reach a low-carbon trajectory. When the value of an existing asset falls, there is no obvious immediate cash impact on the economy. However, there is still an important impact on the ability of an economy to finance its growth and investment needs. Take the example of a homeowner whose house value falls 50%. After the price drop, the owner may no longer be able to borrow against the house to finance home improvements or even buy additional properties, and in the worst case, may no longer be able to pay off the debt. For the energy industries, stranded assets related to the transition could be particularly important if the very companies that are expected to finance the transition, such as electric utilities, are the ones who no longer have the financial firepower to make new investments. Value rather than output: The financial impact of stranded assets is not about lost production, but lost value. For example, under our evaluation scenario, even oil producers whose output is unaffected by the transition could see the value of their oil production fall by up to 60% due to falling wholesale oil prices that result when demand declines. A loss in wealth, not an ongoing cost: Stranded assets are a one-time hit to expected or perceived wealth rather than an ongoing drain in expenses. It is this loss in wealth that could make it more difficult to finance the transition. The impact on the ability to finance the transition is thus roughly the same as a one-time, unexpected cash cost. Expectations matter: Since stranded assets affect markets through declines in expected wealth against which financing can be secured, expectations matter. If the market already expected the policy changes that would lead to a full transition, and further had included the impact of these changes in asset valuations, there would be no asset stranding impact on financial markets. The impact of a low-carbon transition on asset stranding will depend the starting point, the end point, and the process and trajectory of getting there. Thus, current market expectations, the ultimate shape of the transformed economy, and the policy, technology and economic paths followed during the transition determine the stranded asset impact, for it is these three elements that will define the surprise or adjustment that investors will need to make. Describing these three more fully, it is possible to guess, but never fully know, what market participants are thinking based on interviews, asset prices and analysis. The set of assets and industries that comprise a future low-carbon economy can be envisaged, but many versions of that economy are possible, and new possibilities will continue to develop over time as new technologies develop and unforeseen advances and costs reductions are made. As for policy change and the shape of the transition, the Commission sees the evaluation of potential policy paths, including their impact and consequences, as one of the critical responsibilities of policy-makers worldwide. The business-as-usual scenarios are likely to imply higher asset valuations than current market expectations, as investors assume at least some policy action to curb greenhouse gas emissions. For example, major oil companies such as Exxon and Shell typically use reasonably high carbon prices in their investment evaluation process. 57 Furthermore, metrics that investors typically use to value companies, including price-to-earnings 58 (forward PE) and five-year growth expectations, show that markets expect industries like integrated oil and gas companies and electric utilities to grow more slowly than the market in general. The scenarios based on IEA 2DS and 450ppm reflect a feasible path to a low-carbon economy based on current technologies. However, as technology and the economy evolve, new, low-cost carbon-reducing opportunities are likely to emerge, while existing ones will become cheaper. By reacting and selecting the set with the lowest cost, even the path all the way to 2DS is likely to become less costly, with different sets of asset stranding. For example, the rapid decline in solar PV pricing has exceeded expectations from just two years ago. Thus, the business-as-usual and 2°C/450 ppm scenarios are not used as definitive numbers. They are used as guides with the following aims: to help quantify the potential impact of stranded assets; understand how asset stranding costs could be distributed; and identify the potential impact of policy on stranding and implications for policy-makers. For example, the results would be quantitatively but not directionally different had we modelled scenarios more consistent with 2.5°C or 3°C of global warming (i.e. 550 ppm rather than 450 ppm stabilisation levels). Stranded assets are often viewed solely from the perspective of investors and investor-owned companies. It is these investors, after all, who may not be able to invest in new assets once they find their balance sheets weakened by declining asset values. However, when assessing the impact on the global economy, governments and even consumers have an important part to play. A government that could no longer rely on oil exports earnings might find it harder to borrow money or invest in infrastructure. Thus, when examining stranded assets, producers, both investor- and government-owned, are considered first, and then in the case of oil, the analysis is extended further to consumers. After all, falling prices may impact an oil producer, but depending on how these flow through to retail prices they could benefit a consumer. A consumer with more cash in their pocket could spend or invest the money that could then flow back into more investment. Beginning with producers, governments and government-owned companies own well over half of global fossil fuel assets by output and reserves. Even for those assets produced by commercial enterprises and owned by investors, governments typically extract significant value through royalties or taxes. Therefore, it is hardly surprising that governments, rather than investors, face the greatest risk of stranding, as shown in Figure 6. These figures only include the value that governments receive from exports and the taxes and royalties they garner from commercial enterprises operating in their own country. These numbers do not include the profits that governments make on their own consumers, as this is, essentially, just another form of taxation that could be replaced with other taxes with the same economic effect. In fact, many countries choose not to collect all of this profit, instead subsidising their consumers (by comparison with the world price). While they face 70% of the risk as measured by the difference in value between a business-as-usual scenario and a 2DS scenario, if the value that governments could make on their own consumers were to be included, the figure would be well above 80%. Climate Policy Initiative modelling, based on data from Rystad and Platts. Based on the stranded assets modelling conducted for the Commission, nearly 80% of the fossil fuel-related CO2 emissions reductions in low-carbon scenarios come from the reduction in coal production and use. This refers to the reduction in carbon emissions required to stay on a 2°C pathway. At the same time, coal only represents approximately 12% of the potential stranded asset cost. Therefore, if asset stranding is a major concern, then focusing on reducing coal use makes economic sense. Furthermore, approximately 70% of coal consumption is in the power sector. As outlined above, a low-carbon transition in the power generation sector could yield a net benefit to the global economy. Production cost, ownership and taxes are allocated based on commercially available data sources, such as the Rystad database of 66,000 global oil and gas fields and various other cost and ownership data sources. For the price and quantity of coal, gas and oil production, supply and demand modelling was developed to forecast which production would be curtailed because it is too expensive to operate under different scenarios and how prices in commodity markets would react to falling demand under a transition. o These supply models are based on aggregations of cash costs and investment costs from the same data sources, adjusted to account for the impact of sunk costs, transport costs, investment returns and in the case of gas, the interrelationship between oil and gas supplies. o The oil demand model is based on International Monetary Fund forecasts for country-by-country GDP growth, and historical multipliers for the relationship between GDP and oil consumption in the absence of price changes. How demand would change for any given future price expectations is then forecast, based on a number of studies of oil sensitivity to price changes. o Demand for coal oil, gas and power under the low-carbon scenarios is based directly on the IEA low-carbon scenarios. o By comparing these demand estimates against the supply curves generated by the supply models, market price and which production assets will be needed in a given year can be estimated. With this in hand, price minus cost is the value achieved per unit of production which can then be multiplied by quantity or output to define yearly profit. This profit is split between royalties and taxes and corporate profits, and then assigned the specific assets to companies and countries. Annual profits from 2015 to 2035 are then discounted to estimate value for any given asset.A discount rate of 8% is used to represent the return in the general market that the re-invested revenues from these assets could support were they not to be stranded. Higher or lower discount rates affect the headline number, but do not materially alter the relative impact and insight that this analysis brings. Finally, asset values are compared by owner between the business-as-usual and low-carbon scenarios to estimate the asset stranding impact on various players. Unlike coal, gas or oil there are no reserves to strand, only production assets. In the developed economies, recent air pollution legislation, such as the Large Combustion Plant Directive (LCPD) in Europe and the Mercury and Air Toxic Standards (MATS) in the US, has led to the retirement, or pending retirement, of coal-fired power plants. In these cases of retirement, the plant owners decided to close plants rather than invest in upgrades to reduce pollutants like SOx, NOx or particulates. This impact is shown in Figure 7. Some of the remaining plants in developed countries are old and without investing in life extension could be nearing retirement. It is assumed that all plants that have pollution control retire “early” at 60 years, while those that do not retire at 40 years. Based on the prevalent market prices for power, coal and other costs, it is calculated that the value that these plants forgo by not operating an additional 20 years, once life extension and maintenance costs are considered. In Europe, the additional value of these plants is particularly small, since we assume that the market expects that carbon prices will return, over time, to 25 euros per tonne. As a result, some US$28 billion of the US$32 billion of stranding risk occurs in the US. Some of the plants that remain will be converted to low load factor, more highly flexible plants, and not therefore written off entirely. There are significant limits to the ultimate flexibility that can be achieved, depending on market design. The modelling conducted suggests that some power plants may be able to maintain profitability in a renewable-heavy generation system by offering flexibility services in support of the renewable energy build-out. Climate Policy Initiative analysis, using data from the European Commission (LCPD retirement projections), IEA, and Platts. Climate Policy Initiative analysis, using data from IEA, Platts. Beyond the stranded asset risk, this analysis highlights the urgent need to develop low-cost, low-carbon alternatives, including energy efficiency and renewables, to avoid the need to build more coal-fired power plant to support economic growth. CCS technology would also allow for more build-out of fossil fuel generation without stranding assets. Nearly three-quarters of stranding risk lies in the oil industry. The risk is high partly because oil reserves are relatively large and continue to grow. The most important reason, however, lies in the global supply curve for oil and the relative sensitivity of oil prices to demand. As descried in Box 6, we have modelled supply and demand for oil through 2035 as a function of the oil price. When oil demand falls, the most expensive new production is no longer needed and the remaining producers compete to sell oil into an oversupplied market. Prices are likely to fall as a result, notwithstanding the unusual structural characteristics of the global oil market. To assess the stranding risk, the producer price for oil that would be consistent with output at the IEA 450 ppm scenario levels was forecast. This was then compared with the forecast of oil demand and supply based on the analysis set out in Box 6. Additionally, the impact that the Organization of the Petroleum Exporting Countries (OPEC) members could have was modelled. It was found that given recent changes to non-OPEC supply and at these levels of demand, OPEC would be unlikely to be able to maintain, or benefit from, higher oil prices as the lost profit from production they would need to remove from the market would exceed the benefits of the higher prices. Climate Policy Initiative analysis, using data from IEA, IMF and Rystad. This modelling demonstrates an important dilemma in the oil transition. If demand falls to the 450 ppm level, oil prices are likely to fall. By 2035, the 450 ppm price for oil could be less than half of our forecast for the business-as-usual scenario. This decline in price is the most important contributor to oil asset stranding risk. Indeed, our natural gas market modelling suggests that by 2030, low oil prices would also begin to suppress the price of liquefied natural gas and cause further risks there. Yet, if prices were to stay low, and no other action was taken, demand would grow. The demand modelling suggests that prices would need to be almost 40% higher than the business-as-usual case to supress demand to the 450 ppm levels. With higher prices, over time consumers would buy more efficient cars or electric vehicles and move closer to work, logistics chains would shift to reduce transport costs, and prices would spark innovation in new energy saving. Innovate to shift demand by creating low-cost or more attractive alternatives. Governments can induce innovation through several channels, including implementing financial incentives, imposing fuel economy standards, and sponsoring research. For either of these solutions, the impact on the economy and investment extends beyond just the stranding loss faced by producers. With taxes, governments will benefit from tax receipts, while consumers will suffer from higher prices; although governments could, presumably, lower other taxes to compensate them for their higher costs. In the case of innovation, consumers will benefit from lower fuel prices, as even in the 450 ppm case oil demand continues at around 80% of today’s level. When taxes are the primary mechanism for consumption reduction, the net stranding impact — broadly defined to include governments, producers and consumers – amounts to US$3 trillion of lost value.59 This figure accounts for all of the investment required to make the transition happen on the consumer side as well as the producer side, as the consumer response inherent in our demand curves effectively value the trade-off that a consumer would see, for instance, in moving a warehouse closer to consumers to reduce transportation costs. Alternatively, if innovation could spark a transition without the need for consumer trade-offs, taxes would not be needed and the benefits of lower fuel expenses to consumers would outweigh the stranding of producer assets by US$7 trillion. Clearly, innovation is unlikely to be costless and some consumer trade-offs could be useful. This suggests that the eventual answer lies somewhere in between. A mix of tax incentives and investments in innovation will lead the net stranding costs to lie somewhere between these two extremes. While governments bear the majority of risk, the threat of asset stranding is real and could have a significant impact on overall investment performance. As in Box 8, many financial investors may choose to ignore the dilemma by maintaining equal weight positions – that is investments that reflect the share of fossil fuel in the overall market — in the fossil fuel industry and avoiding illiquid assets that could trap them as policy changes. Many institutional investors and sovereign wealth funds seek to maintain or grow their relative share of the global or regional economy. These investors diversify across the entire economy, owning shares of industries in correspondence to their weight in the market. They continually rebalance to maintain an equal weighted portfolio. For these investors, taking a position different from the benchmark constitutes a risk. Thus, owning less than the market share of the fossil fuel sectors constitutes a risk as much as having too much exposure. If these investors are convinced that the market is underestimating the risk that policy will change, and therefore the oil and gas sector is overvalued, they might reduce their investments in the oil and gas sector, seeking to outperform the market based on this insight. If enough investors take this stance, the relative share prices of oil companies would fall and markets would rebalance. In this respect, current valuations reflect average market perceptions as to whether policies like taxation or innovation will be implemented, and how strongly. The risk to investors is that they have over- or underestimated the impact and timing of the potential new policies, technology changes, or public opinion. Many investors avoid this risk by maintaining equal weight positions and then rebalancing their portfolios each time relative valuations change. An investor pursuing such a strategy would maintain their market-like performance. Only those investors who are overweight in sectors, especially those locked into illiquid, or difficult to sell, positions, would bear risk that policy change might accelerate. We note that many sovereign wealth funds in hydrocarbon-rich countries are already overly exposed to fossil fuels and derive new cash flows from their fossil fuel revenues; they would benefit from diversifying their investment portfolios away from hydrocarbons, and many are already doing so. Yet others may choose to bet that the market is not pricing all of the risk of the sector into asset values, and thus maintain little or zero exposure to the sector. Others may view the risk as being overstated by the market and thus increase their exposure to the sector. At the end of the day, it is policy that will drive the transition, and it is investors’ views on policy development that will lead them to take a position on investing in the sector. Uncertainty around policy will lead to a wider range of investor views, which will, in turn, facilitate a divergence of views amongst corporate investors in actual projects. Where there is a divergence of views, there will be a greater risk that corporate investors may invest in assets that could eventually be stranded. The short and simple lesson is that policy ambiguity not only increases the medium- to long-term risk of significant asset stranding. It also affects short-term economic performance by reducing investment activity, including the creation of associated jobs; and it also adversely affects medium-term economic performance by limiting the productivity benefits that better energy infrastructure could have generated. Sending clear policy signals – possibly including an effective carbon pricing or energy tax regime and investments in innovation together with appropriate sectoral policies – is the most direct way to limit stranded asset risk and at the same time, to reduce investor uncertainty. Investment in low-carbon energy can both strengthen economic growth and cut carbon emissions. Mobilising capital presents a challenge, however, because a low-carbon transition requires new and sometimes unfamiliar assets and policies. Low-carbon policies will also impact the value of existing assets. The Commission makes recommendations to governments, financial regulators, and national and multilateral development banks along these two themes: how to stimulate low-carbon investment, and reduce the cost impact of stranded assets. Provide long-term policy signals possibly including carbon pricing, resource pricing and regulation. These will ensure that there is a robust business case to invest in a low-carbon economy. Further details of policies to reform asset pricing are provided in Chapter 5: Economics of Change. Develop financing arrangements, industry structures and market designs that reflect the infrastructure characteristics of many of the assets underpinning the low-carbon transition. Develop commercial investment vehicles that provide investors direct access to low-carbon infrastructure including renewable energy. This contrast with the present model of investing as shareholders in renewable energy developers including utilities. These alternative investment vehicles, including YieldCos, municipal finance, and crowd-funding, may reduce the annual investment return requirement by 1-2% and in so doing reduce the cost of renewable energy by up to 20%. Explore expanding direct financing of low-carbon infrastructure by regional, municipal and national governments, potentially using national infrastructure banks, infrastructure bonds, and green bonds to reduce capital costs. Such direct infrastructure finance also reduces renewable energy costs by as much as 20%. In middle-income countries facing high interest rate environments, replace all or a portion of support for low-carbon infrastructure, such as feed-in tariffs, with low-cost debt. This could reduce the total subsidy (including debt concession) by as much as 30% or more; reduce the cost of energy; and harness other benefits from renewable energy such as reducing foreign currency needs to buy imported fossil fuel. Develop or strengthen the capabilities of national development banks to perform this new role of providing low-cost debt to low-carbon infrastructure projects, while enhancing systems to ensure the efficiency of project selection and development. These banks may be an appropriate conduit for international financial flows into the industry. For low-income countries, continue multilateral and bilateral development bank assistance as a major source of investment and aid for energy system and infrastructure development. Enhance development cooperation to support country-led domestic policy and regulatory reforms that can strengthen enabling conditions for investment in energy infrastructure. These institutions should review their policies to ensure that development is consistent with a low-carbon transition, including the phase out of high carbon projects. Where needed, development finance institutions should be strengthened or created to support low-carbon financing. In both developed and developing countries, consider restructuring the electricity industry, market design, and regulation in accordance with the financial and operating characteristics of low-carbon infrastructure, and in so doing lower the cost of capital for low-carbon energy. In all countries, focus on opportunities to reduce consumption of coal. Commission modelling suggests that coal represents an opportunity to achieve 80% of the emissions reductions under IEA’s low-carbon scenarios with only 12% of total stranded asset value. In high-income countries, avoid investment in coal-fired power plant, including new build and life extension. Retire existing plant at the end of their normal life or when major refurbishment would be required. One exception to the no new investment rule would be investment designed to increase the flexibility of coal-fired power plant in ways that would support renewable energy and enable reduced operating hours of coal-fired power plant (and emissions) while maintaining profitability. In emerging markets, slow down the construction and planning of new coal-fired power plant, as new-build plants could create a significant stranding risk to existing plants. To maintain economic growth in rapidly developing countries while slowing growth in coal-fired power plant, there is an urgent need to develop and scale alternative technologies, low-carbon manufacturing capabilities, energy efficiency and low-cost financing arrangements to create viable and cost effective replacements for coal as an energy source. In general, across all of the high-carbon investment sectors, the transition from the fossil fuel investment should be addressed by demand strategies. For example, oil use in transport should be gradually reduced through a combination of consumer taxes and innovation in alternatives and vehicle efficiency standards. With oil-producing country governments facing the greatest asset stranding risk, there will be a need to address and manage the budgetary consequences of reduced demand and the falling oil prices that would result. This should include more rapid phasing out of current fossil fuel subsidies. For net consuming countries, policies used to reduce demand will need to be developed carefully, but the benefits to net consuming countries of lower fossil fuel prices and energy savings could create room for policies to smooth the transition and avoid significant distortions associated with asset stranding. Overseas Private Investment Corporation (OPIC), 2011. OPIC Political Risk Insurance for Regulatory Risks – Coverage for Feed-in Tariffs. Washington, DC. Overseas Private Investment Corporation (OPIC), 2012. OPIC Expropriation Coverage for Feed-in Tariff Projects. Washington, DC. Overseas Private Investment Corporation (OPIC), 2012. OPIC Contract of Insurance against Expropriation (including FiT and Business Income Loss) – DRAFT. Washington, DC. IEA, 2012. Energy Technology Perspectives.